I don’t know how this night would develop because I was already in a bad mood. I’m sure you’d feel the same way. So let’s see how somebody’s tantrums and my sarcastic recommendation for a restaurant would turn out. 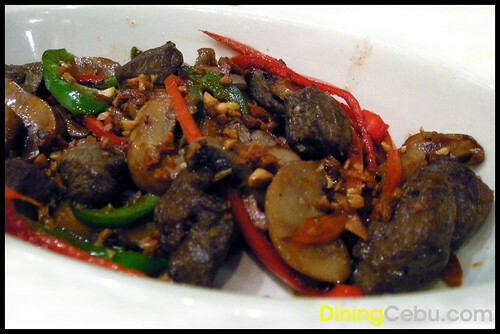 Metro Cafe’s Beef Salpicao looks like liver strips because of its dark color and texture, but it’s not. Berg describes the beef used as like your regular working class Pinoy beef and unlike those coming from Japan. It’s very garlicky and nothing really surprising from what you’d expect from a salpicao. 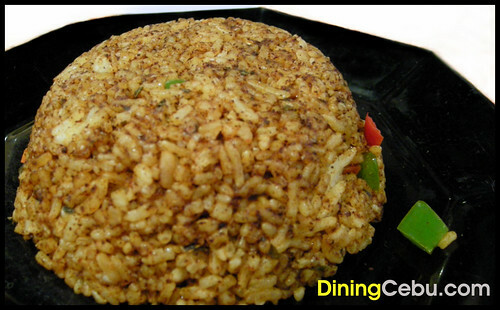 Metro Cafe’s Salpicao came with a Tex-Mex rice. Berg is confused whether he likes it or not. The rice appears to be very rich in texture but the flavor is very subtle and reminds him of a cumin-turmeric flavoring mix he loved to prepare. 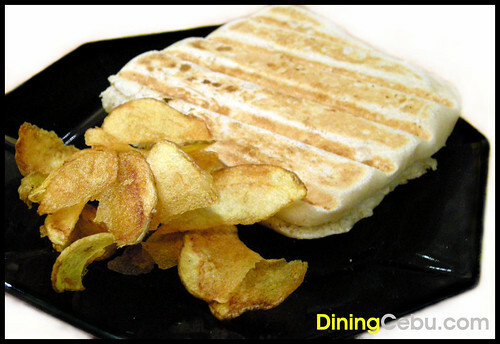 Berg hasn’t tried a panini, and for a long time wanted to experience what it’s all about. The appearance looks nice because of its shape and the grill marks. I see it as somewhat a pancake, but it’s just your regular loaf bread. Berg loves this Hungarian sausage and cheese panini but unfortunately has no basis for comparison. Did you know that a panini (plural for panino) just means “sandwiches”? 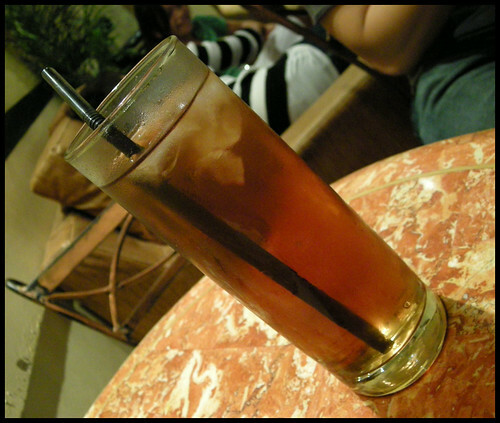 Berg puts this as one really HOT and one real KALAMANSI juice. It was a nice touch too having the sachet of sugar in place and not pre-mixed with the juice. Nothing from Metro Cafe’s main courses enticed me to order that night. That, and because I did not want to eat at this Cebu restaurant in the first place. 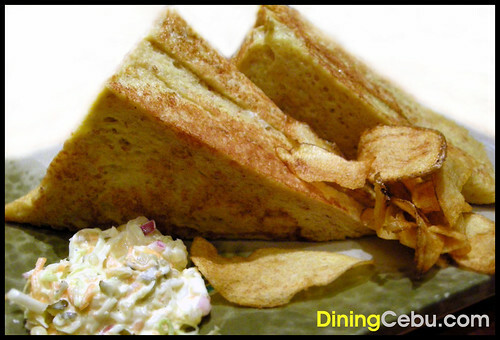 Luckily the Monte Cristo sandwich intrigued me ever since I knew about this kind of sandwich in Casa Verde. If you remember, I mentioned in our Kopi Roti experience that I want my French toast to be smothered with egg. I got my wish in this Monte Cristo sandwich. I am so happy with my sandwich. Everything from the wheat bread, chicken, ham, cheese, and dressing was intensely satisfying and tasty. I was even supposed to share Berg some of it, but I devoured it down to the last crumb! Metro Cafe’s Monte Cristo sandwich comes highly recommended! 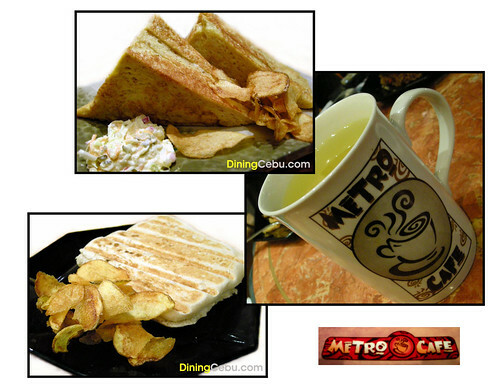 You will enjoy Metro Cafe in Metro Ayala Cebu because it has a lot to offer from its wide variety of international sandwiches, Pinoy favorite main courses, hot and cold drinks, and desserts. The food in Metro Cafe is not bad considering it’s just a cafe and not a full-pledged restaurant. So if you are looking for a quiet restaurant in Cebu away from the hubbub just for a pit stop, a business meeting, a secret rendezvous, or a colloquy with cholokoy friends, then Metro Cafe in Ayala Cebu is definitely the place for you. 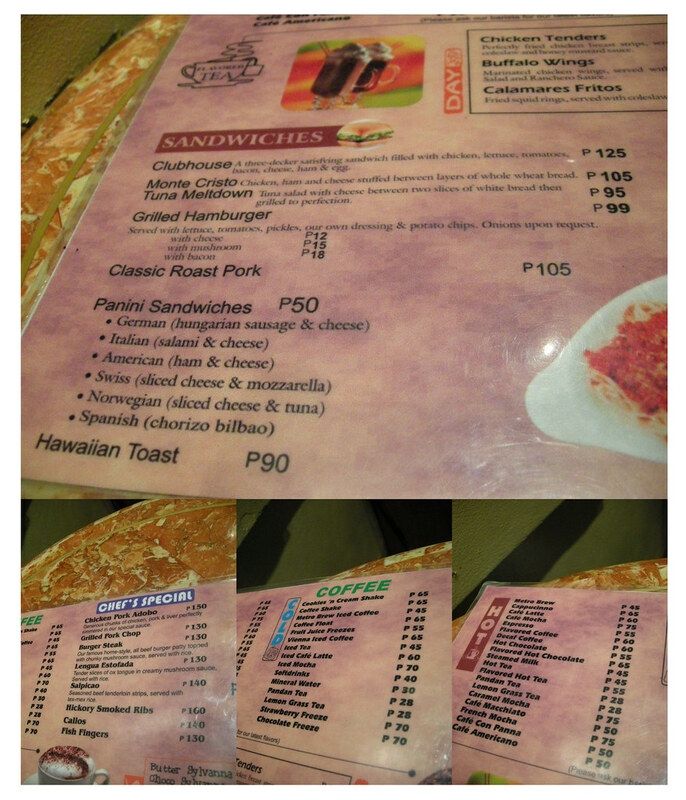 Click on the below image to see more of Metro Cafe’s food choices and prices. so you did enjoy Metro Cafe after all then…happy accidents??? @jon: Yeah, surprisingly I enjoyed it that night. We should thank “somebody” then for the experience hehe. 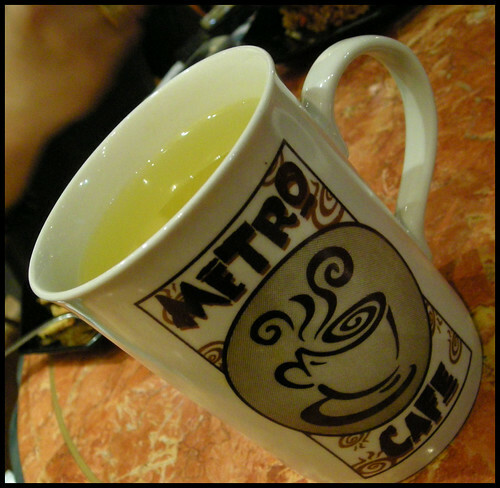 My first experience with Metro Cafe was not bad also. We had burger and pasta, and it was alright. The food! I love it! Specially the German Panini Sandwich.I love Sandwiches.